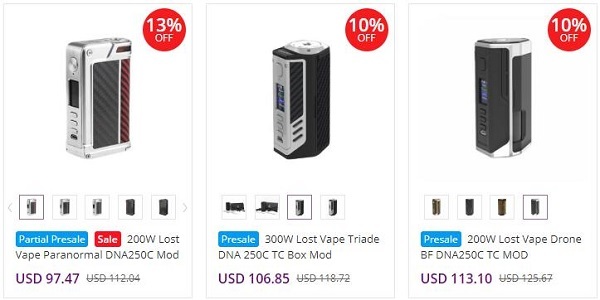 Thread: Authentic LostVape Brand Deal, Paranormal 200W DNA250C Only $89.47 for New Users! DNA Chip Box Mods are well-received and widely considered as some of the most accurate & customizable devices in the community. Lost Vape is known as the leading manufacturer in this respect. Integrating the famous Evolv's DNA chipsets into their high-end vape devices such as Paranormal, Triade, and Drone, Lost Vape aim at the consumers who are more discerning and after a tailor-made vape experience. But if you are common vapers looking for a reliable & high performance device with enough budget, Lost Vape DNA mods are also your best choices. And now good news, you can get these DNA mods with super amazing prices at buybest. If you are new customers, you can also use a $8 off coupon code which will be put in your buybest account. Enjoy! Thank you & happy weekend.